The latest version of Apple’s Safari web browser offers a new, eye-popping way to view your open browser tabs—provided you’ve updated your Mac to “Mountain Lion,” that is. Just click the new “show all tabs” button in the top-right corner of the Safari 6.0 interface, and presto: your tabs will simultaneously shrink and spread into a row, giving you a bird’s-eye view of all your tabbed web pages. 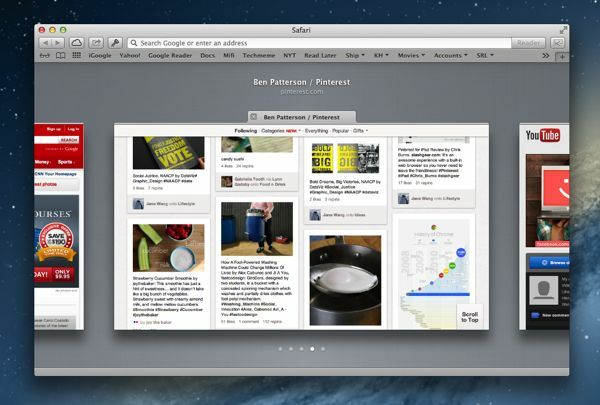 Just click the “Show all tabs” button for a bird’s-eye view of your tabbed web pages. Got a MacBook? If so, there’s another way to activate the new “Tab View” mode: by “pinching” your trackpad while the Safari window is active. Next, try tapping the arrow keys on your Mac’s keyboard or swiping left or right on your trackpad to cycle through your various tabs. Find a tab you want to view? Just click it, and it’ll expand to fill the Safari window. Can’t find the “Show all tabs” button on your version of Safari? That’s probably because you haven’t installed Apple’s “Mountain Lion” system update on your Mac yet. For more details on “Mountain Lion,” including what’s involved in updating your system, visit our Mac OS X survival guide. Want to rearrange the order of your browser tabs in Safari, Chrome, Firefox or Internet Explorer? Easy: just try clicking and dragging them. You can also click a tab and drag it out of the main browser window; doing so will turn the tab into a new, separate browser window. Last but not least, you can drag a tab from one browser window to another. Looking for more Mac tips? Click here!